This is a brand new picture, photo, diploma, poster frame. This Antique Gold with Beaded Detailing frame is made of solid wood moulding, measuring 1.5'' thick, with a 0.4375 '' deep rabbet (the space below the lip to the bottom of the frame) which is carefully made to the highest quality industry standards. This frame comes . This designer frame is a unique frame that you will not find in most frame shops. The frame is perfect to lighten up your most cherished picture, photo, art gallery, poster, photograph, painting, diploma, artwork, craft project, needle-point or more, yet modest enough to match just about any environment. This Antique Gold with Beaded Detailing frame works perfectly with black-and-white and color pictures or paintings. Makes a nice Christmas gift! Please don't hesitate to browse through our policies and feedback. 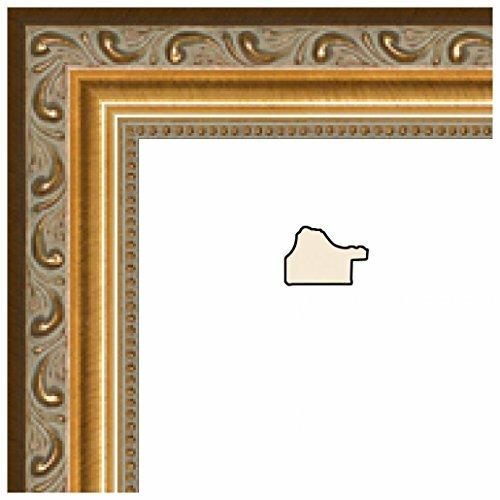 If you're not sure this is exactly the frame you'd like, feel free to use the search at the top of this page and search ArtToFrames to view our huge selection of wood picture frames,metal picture frames, and premade picture frames. Don't forget to add us to favorites, so you don't have to search for us again next time you need a picture frame! Comes with Glass (16x20 or smaller) or Plexiglas (lager than 16x20) and hooks for wall mounting! Warranty: 30 day money back guarantee, for damages during shipping all packaging must be saved for claims.